The reputation of Sequential Circuits is up there with the likes of Moog and ARP, but is the first Prophet in 20 years a worthy addition to that heritage or a cash-in on former glories? It's possible that some readers have heard the names 'Sequential Circuits' and 'Prophet' but don't know what the fuss is all about. But for those of us old enough to have been playing keyboards since the 1970s, or who have contracted the vintage synth bug more recently, the names of both the company and its most famous line of products are magical. In part, this is technological: the original Prophet (released in 1977, and now known universally as the 'Prophet 5') was the first polyphonic synthesizer that could store the value of every parameter in its voicing and control structure. This made it a marvel; the first polysynth on which you could punch in a patch number, and recall the actual sound that you had stored. If you weren't performing in the '70s, you can barely imagine the impact that this had. But, more significantly, the response to the Prophet name is an emotional one. The synth sounded fantastic, with a rich, warm and — at the time — instantly recognisable character that was a million miles from the larger and more temperamental polysynths (the Oberheim 4-Voice and Yamaha CS80) that had preceded it. 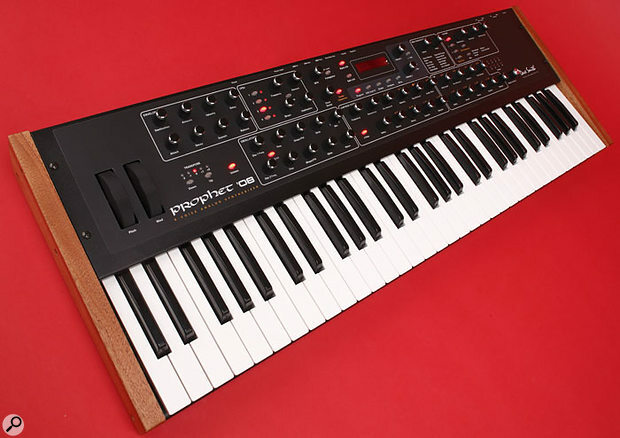 In many ways, the Prophet set the standard by which subsequent polysynths would be judged and, even after competitors brought similar instruments to the market, a mystique still surrounded the name. This was enhanced by its professionals-with-a-contract-only price tag. A fellow Sound On Sound writer, on a world tour and playing at Madison Square Garden that evening, was refused service in a well-known New York store because he 'didn't look like he could afford one'. But those who could afford them (and who could get served) eulogised and, for a while, you couldn't avoid the Prophet. Whether your taste ran to Phil Collins' 'In The Air Tonight', all of Peter Gabriel's early solo albums, Paul Hardcastle's '19', Japan's Tin Drum, or even the bass lines on Madonna's Like A Virgin... you were listening to Prophets. For six years, Sequential Circuits flourished (see 'The History Of The Prophets' box) and the company and its founder and chief designer, Dave Smith, enjoyed an enviable reputation. But the world changed in 1983 when Yamaha released the DX7, and manufacturers of big, heavy analogue polysynths found themselves in deep trouble. ARP had already folded, and within a few years, Oberheim, Moog and Sequential Circuits followed. By 1987, the era of the analogue polysynth seemed forever over. As we now know, reports of the death of analogue synthesis were exaggerated, and although Smith spent the best part of two decades working in the digital arena with Yamaha, Korg and Seer Systems, he moved closer to his roots again when he established Dave Smith Instruments (DSI) and released the hybrid analogue/digital Evolver and Poly Evolver synthesizers. These carved significant niches for themselves, so it might have seemed likely that he would continue developing this brand. But then, out of the blue, Smith announced that his next keyboard would have an analogue signal path, and would be the first keyboard to bear the Prophet name in 20 years. You can imagine the questions this raised among aficionados. Would this be a cynical naming exercise designed to lure musicians into buying something that it was not? Or would players again be able to walk into a shop and buy a new, reliable, synth that looked like a real Prophet, played like a real Prophet and sounded like a real Prophet? The Prophet 08's rear panel, with dual outputs and extra 'poly chain' MIDI out.Photo: Mike CameronSo I asked Smith why he had chosen 2007 to step away from the Evolver and to resurrect the Prophet name. He responded: "It's true, the Prophet 08 design started as an alternative to the Evolver with two targets: a reasonably-priced eight-voice synth, and an all-analogue signal path. I had received many requests for both of these, but I hesitated because I love the Evolver signal chain, and I was worried that a traditional analogue, eight-voice synth would be too simple and not as interesting in comparison. Nevertheless, I decided to give it a go and, as the instrument came together and I started playing it, I was pleased to hear how good it sounded. It was only then, late into the project, that I thought of calling it a Prophet, since it really does have a sound worthy of the name. While it cannot match the Evolver's range of tonal variations, it delivers that magical analogue punch and depth." For many years, there has been no opportunity to buy an affordable, fully integrated, keyboard-based polysynth with an all-analogue signal path. Perhaps the closest would be the Alesis A6 Andromeda (Sound On Sound, April 2001). This shares much of the Prophet 08's hybrid architecture, and its digital effects are even placed in a side-chain so that you can retain a pure analogue DCO/VCF/VCA signal path, as in the 08. But the Andromeda is a much more complex and expensive beastie, and it sports a very un-vintage look and feel. Consequently, laying hands on the Prophet 08 for the first time is like greeting a long-missed friend. With its responsive, five-octave, semi-weighted keyboard, traditional pitch-bend and modulation wheels, sturdy chassis, wooden end-cheeks and good-quality hardware, it feels like a vintage analogue synth, while the layout of the controls looks as you always imagined a modern Prophet would. So the 08 is still similar in look and feel to a vintage Prophet, but it's not the Prophet 5 that it recalls, it's the Prophet 600, to which it bears a remarkable resemblance that turns out to be far more than skin deep. The 600 was one of the first 'hybrid' synthesizers to embrace the concept of an all-analogue signal path coupled to digitally generated modulators, and this is a very good description of the 08. Eschewing the samples, DSP-driven virtual-analogue synthesis and gazillion digital effects of the past couple of decades, the 08 is a traditional analogue/digital hybrid in which each voice comprises an all-analogue signal path of a couple of oscillators, a low-pass filter and an amplifier, plus a goodly complement of digitally-generated LFOs and contour generators. Indeed, the similarities run even deeper that that, because the analogue chips on which parts of the 08 are based were developed from the original Curtis (CEM) chips found at the heart of many vintage synths. But will the 08 appeal if you have never played one of its ancestors and don't enjoy (or suffer from) this perspective? Happily, yes. 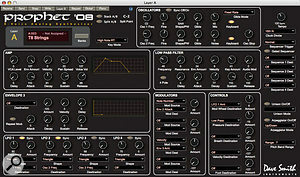 Unlike the many virtual analogue synths that are too feature-laden to be intuitive, but in common with many revered vintage synths from the late 1970s, everything on the 08 falls to hand, in large part because most of the knobs are single function and don't rely on menus and screens to tell you what they will do. OK, the knobs are rotary encoders rather than potentiometers, so you can't look at the panel to 'see' the sound. What's more, they are a little lightweight and wobbly, and even brushing against one will bring it into focus. But when you move one, its value — both before and after editing — is displayed on the small LCD screen, and when you turn it, the parameter value picks up from its existing value, so there's no glitch, which was not always the case on some vintage synths. There are other nice touches, too. For example, you can press '+' and '­' simultaneously to return a parameter to a default, and you can press Program and '+' simultaneously to place the current Program into a 'basic' form from which you can build a new sound. Touches like this raise a synth above the merely useable and, while a handful of menus are necessary, there are no sub-sub-sub-sub-menus to confound and annoy. The only thing that I missed was a way to type values directly into parameters, or to select patches at opposite ends of the memory without scrolling. A keypad would have satisfied both needs but, unfortunately, there isn't one. Despite the similarities, the Prophet 08 is no slavish recreation of an original Prophet; there's too much that is new for that to be the case, including velocity and pressure sensitivity (which was only introduced on the T8) a four-channel analogue-style sequencer, an arpeggiator, a modulation matrix, and even an optional software editor/librarian. Furthermore, a peek around the back shows that there must be some significant differences in the sonic architecture itself because — in addition to a headphone output — there are two pairs of signal outputs. This is because each of (what appear to be) its two banks of 128 patches is in fact a Program containing two patches that can be played independently, layered, or placed either side of a user-defined split point. If you insert a pair of cables into the 'A' outputs alone, both patches appear here, but if you insert a second pair into the 'B' outputs, the two patches can be treated and mixed individually. So what we have here is the equivalent of two, stereo Prophets, which suggests all manner of exciting possibilities. What's more (and unlike some vintage analogue synths) the Prophet 08 does not use a central repository of patches to build its Programs. This is a cursed architecture, wherein changing a patch in one Program will often wreck another. In the Prophet 08, there are 512 distinct patches comprising the 256 Programs. Staying around at the back for a moment, the 08 offers inputs for an assignable CV and a sustain pedal, plus the usual three MIDI sockets, but there's another socket that might cause a double-take: a fourth MIDI socket, called Poly Chain Out. This is an idea that has been around since the earliest days of MIDI but is implemented far too rarely: it allows you to connect a second instrument to double the polyphony. This is not the same as chaining two 08s using a conventional MIDI connection, because the voice assignment is intelligent, and if you save a Program on the Master it's automatically saved to the Slave. The final hole accepts the input from a wall-wart. Divorcing the power supply from the instrument contributes to the lightness and compactness of the synth and makes it easier to satisfy various electrical and safety regulations but, let's be honest, a DC input feels less professional than an IEC socket. Dave Smith produced his first synthesizer in 1977. He designed this while building a Minimoog programmer and an early digital sequencer and, whether by luck or craft, he hit upon a classic. Based on SSM chips, it looked and sounded like the instrument we now call a Rev 1 Prophet 5, except that there were two versions: one that could play five notes and one that could play 10. Unfortunately, the expanded version was unreliable and the only solution was a radical one: most were converted back to the five-voice synths that we now know as the Rev 1 Prophet 5. This Prophet remained unreliable, but its second incarnation (of which there were to be three revisions) was a more robust beast. Then, in 1980, the company reworked the synth around Curtis chips, which entailed a thorough redesign, so it's remarkable that its sound remained almost unchanged. Sequential's next product was the twin-manual Prophet 10. More than two Prophets in a box, this monster could allocate its voices in several modes, ranging from a two-oscillator-per-note 10-voice synth, to a monosynth with 20 oscillators under a single key. In 1983, the Prophet 600 appeared. This was the world's first MIDI synthesizer, and one of the first to use hybrid (analogue/digital) technology. Unfortunately, its digitally generated envelopes responded more slowly than analogue circuits, and its controls were audibly quantised. Later that year, Sequential released the Prophet T8, a close relative of the 600 that boasted a piano-weighted keyboard with polyphonic aftertouch. Unfortunately, this was the year that the Yamaha DX7 swept all before it, and Sequential lost its place at the head of the market. Perhaps surprisingly, the pitches of the 08's oscillators are digitally controlled rather than voltage controlled. I asked Smith whether he felt that he was taking a risk implementing DCOs rather than VCOs. "DCOs picked up a bad reputation long ago because they were sorely lacking in resolution, and they sounded too stiff," he explained. "Now, with very high-speed frequency control, the oscillators in the Prophet 08 can be exact and lock up (which can be useful sometimes), or they can be precisely detuned, or you can add what we've called oscillator 'slop', which is a slowly varying random frequency change, independent on every oscillator. This is a subtle effect, but it does a great job of mimicking VCOs when you want that characteristic VCO sound." A digital clock will lock an analogue oscillator to its chosen frequency to a high degree of accuracy, which may not be what you want for a given sound. Smith's 'slop' introduces a recognisable thickness, so many will leave it permanently switched on. However, being able to defeat it has its uses; you'll never find that the concert-hall-shattering-note you expected comes out as an apologetic squeak because the two oscillators are out of phase with respect to one another! Given the two instruments' similarities, I decided to compare — as much as one can in an integrated polysynth — the sound of the Prophet 08's DCOs against the VCOs of my Prophet 600. I started with the sawtooth wave... and was stunned. The difference between the 08 and the 600 were no greater than the differences between Prophet 600 voices! However, the 08 soon began to reveal its individuality. The triangle waves were not identical, with the older instrument revealing mild distortion somewhere in the signal path, and the newer being rounder and woodier. Likewise, the 600's pulse waves were slightly brighter than the 08's. Even greater differences were revealed when I applied hard sync. Since the vintage instrument uses VCOs and the new one uses DCOs, the sync mechanism has changed, and sync'ed sounds are not the same on the two. I'm not sure that either is better or worse; they are just different. There are differences in implementation, too. On the 'plus' side, the 08's oscillators score by being able to produce pulse waves that are narrower than the 600's, thus increasing the range of timbres, and they have a wider tuning range. On the 'minus' side, the 08 does not allow you to mix sawtooth, triangle and pulse waves (as the 600 does) but instead offers a sawtooth+triangle mixed wave, and a noise generator. Knowing that the traditional CEM chips used in the early Prophets no longer exist in significant quantities, I asked Smith how the Prophet '08 came to have Curtis filters. He told me: "We're using a customised part that Doug Curtis designed a few years back for the Evolver. As you may know, Doug passed away recently, but his company, OnChip Systems, are still manufacturing the chips for us. The part is similar to the one that Tom Oberheim used in his 'Marion' series of synths a few years back, which in turn was a variation of an older CEM part. In my opinion, this filter has a ballsier sound — I usually avoid using descriptors like that, but everyone knows what it means — than the CEM3320s we used in the later Prophet 5s, the Prophet 10, and the Pro One, and I think that this is noticeable if you compare the Prophet 08 to the older synths." Almost all of the Prophet 08's controls can be found on the panel of the instrument.Photo: Mike CameronI decided to check this, but was surprised to find that filtered sounds on the 08 sounded very different from (ostensibly) identical patches created on my original Prophets. This was most noticeable when I turned up the resonance to invoke filter self-oscillation; sounds that use this can be played in tune across the whole keyboard on many vintage synths, whereas the oscillation generated by the 08's filters in 24dB/oct mode was not. I mentioned this to Smith, and he suggested that I invoke the calibration routine. What a difference! The filters in the 08 now sounded consistent and tracked almost perfectly. There are two filter modes; a self-oscillating 24dB/octave (four-pole) mode, which recalls the original Prophets, and a non-self-oscillating 12dB/octave (two-pole) mode, as used on the Oberheim OB series and the Yamaha CS series. Programming the filters in 12dB/octave mode created a different palette of sounds that some commentators have already compared to the OB family. This is a knee-jerk reaction that occurs whenever people see a two-pole filter, and is no more accurate than saying that every polysynth with a four-pole filter sounds like a Memorymoog. In truth, the 12dB/oct mode on the 08 has its own pleasing and flexible character, and in some ways I prefer this to the rather distinctive sound of the OBs. Inevitably, the 08 offers facilities in the filter section that the original Prophets did not, including such things as fully variable keyboard tracking and inverted contour control. I also found that the amount by which the filter could be swept was far greater on the 08 than on previous models. In contrast, the amount of audio frequency modulation that you can apply to the filter is not as great as I had expected, and whereas vintage Prophets can use any combination of their oscillators' waveforms as modulators, the 08 is limited to a single waveform. This means that filter modulation on the older synths tends to stray deeper into sci-fi territory, whereas the 08 is more cultured and musical, especially when the frequency of the modulating oscillator is swept or the depth of modulation is varied. Yet, despite all of these differences, no Prophet aficionado will feel ill at ease with the 08's filter architecture or sound. It is still recognisably a Prophet. The Prophet 600 was the first Prophet to use digitally generated ADSR contour generators, and while these were remarkable technology for 1983, they were famously sluggish. "Digital envelopes got a bad rap (deservedly) in the 1980s, due to their slow update rate," Smith admitted to me. "In contrast, the Prophet 08 update rate is super fast, so you get the best of all worlds: nice, snappy envelopes, but at much lower cost than a true analogue eight-voice with analogue envelope generators." He's right, and as well as being fast and offering an extra stage, the 08's three sets of HADSR contour generators offer a huge range of routing possibilities, with — in the case of Envelope 3 — looping for non-standard LFO shapes. The difference that 24 years of progress can make is even more apparent when you look at the LFOs. Or, rather, at the single LFO that many vintage polysynths offered for all their voices. The Prophet 08 sports no fewer than 32 digitally generated LFOs (four per voice), all of which offer a wide frequency range — from approximately 0.03Hz at the lower end to 150Hz at the upper — and five waveforms, including random for S&H effects. They can be independently sync'ed to the keyboard (or not) and can receive MIDI clock, all with a wide range of sync options. Sure, they share a single set of controls, but programming them is simple and, to help you, the LEDs next to each of the LFO selector buttons flash at the appropriate frequency and with the appropriate waveform. This makes it possible to spot which LFO is doing what in a complex patch. In addition to all this modulation power, a small (four by four) matrix allows you to direct any of 20 sources to 42 destinations. Programming is again via a single set of controls, but it's still quick and intuitive. This is all a far cry from the Poly-Mod and LFO-Mod (or Mono-Mod) sections on the early Prophets, and you may feel that it isn't true to the spirit of the originals. But the Prophet 5 and its siblings weren't simple because of an underlying philosophy: it was a consequence of cost and practicality. Smith explained, "With 32 LFOs and 24 envelopes, the Prophet 08 would have cost more than $10,000 to implement in hardware! Not only do you need the LFOs and envelope generators themselves, but for each destination you need a VCA for modulation routing. That's why the Prophet 5 had just one LFO and such simple modulation routing. Digital envelopes and LFOs are not only more cost-effective, they are more accurate from voice to voice. This is because they don't have to go through VCAs where they would pick up gain and offset errors." An analogue VCA stage lies at the end of each voice's signal path. This offers variable panning, which allows you to create a stereo field for both the 'A' and 'B' output pairs, and the amplifiers clip mildly if you overdrive them. Also, like the ARP 2600 and many virtual analogue synths, the 08 offers an Initial Level control that allows you to create drones and other effects, but it has no external signal input, so you can't use it to filter external signals. That's a shame. 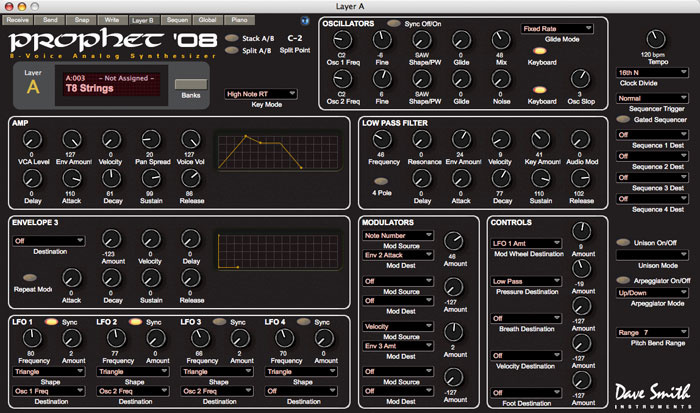 The 08 offers a four-mode arpeggiator that can be driven by the internal clock or sync'ed to MIDI Clock. This can be latched (which is good) but there is no way to play an arpeggio over multiple octaves, and no random mode. I would urge DSI to add these features if there are to be any further software revisions. There's also a sequencer, but lest you fear that the 08 has been compromised by its inclusion, fear not. This is no umpteen-channel workstation sequencer with plug-in effects and whatnot: it's a four-channel, 16-step, analogue-style sequencer similar in philosophy to, say, an ARP 1601 or Analogue Systems TH48. All the usual facilities are included, as well as nice touches such as being able to synchronise the voice LFOs to the sequence to create filter sweeps in time with the music. The fly in the ointment is that there are no dedicated sequencer controls; this is the first place on the Prophet 08 where multi-functionality has reared its head, with orange silk-screening alongside some of the knobs differentiating the sequencer functions from the voicing functions. The panel would need to be significantly larger and more expensive had another 16 (or 64!) knobs been added, so this is forgivable, but there's another decision that I admit to disliking; the sequencer is gated, which means that it only plays when a key is depressed or a MIDI Note On is received. True to the philosophy of the early Prophets, there are no effects built into the 08. To have added modern effects processors would have entailed the use of ADCs and DACs in the audio signal path, but I feel that the 08 would have benefited from an analogue chorus, as on the Prophet VS. Sure, it doesn't need one to sound lush and involving, but it would have added another flavour. At one point, I played the review unit through a Roland Dimension D and... wow! The Prophet 08 boasts an extensive MIDI implementation that allows you to send and receive just about everything to and from the instrument, but to find that it also has an optional computer-based editor came as a surprise. Dave Smith: "It's funny how the whole idea of the Prophet 08 is to have the knobs and instant control, but many players still like using an editor. But, actually, it's quite useful for librarian purposes and for random program generation." Provided free with the SE (Special Edition) and available for download at a small cost for all other users, the editor is nicely laid out, and contains a librarian as well as facilities such as an 'intelligent' patch generator, patch morphing, and an editor for the sequencers. It even provides a mechanism for updating the synth's internal firmware but, for reasons I've failed to plumb, it got four percent through an upgrade to version 1.1 and then stopped, even though the synth responded to all other MIDI goings-on. I can't blame this on my ageing Mac; the editor requires just a Power PC with 256MB RAM and Mac OS 10.3 or higher (or, if you're a PC user, a Pentium 133 running Windows ME, 2000 or XP). Fortunately, the aborted loads didn't scramble the brain of the 08, so I wasn't dismayed, but it still needs addressing. I am often complimentary about developments in DSP, and about the quality of modern emulations of vintage synths. Nonetheless, the 08 demonstrates (even to me) that there remains something special about a really good analogue synthesizer. And have no doubt, the Prophet 08 is a really good analogue synthesizer. It produces superb strings, pads, brasses, leads, basses and all manner of special effects, effortlessly. I even managed to recreate a haunting pad from my Prophet 600 that has eluded me since I stopped using it on stage in 1991. Bliss! I also programmed a 'Hammond' patch that is a particularly stern test of any dual-oscillator analogue synth. Osc 1 provides the 16' signal, Osc 2 provides the 8' signal, and the self-oscillating filter provides the 52/3' signal. When I tuned the 08's filter very carefully, shaped the amplitude envelope for a bit of click, and added some panning LFO for a basic rotating speaker effect the result was... mmmmm! Patching took just moments, but the result was delicious, far better than I could obtain from my vintage Prophets. Now, let's talk about layering. Many years ago, Tony Banks and I discussed how he used 'Dual' sounds on his Prophet 10 to imitate the first four drawbars of his Hammond, eventually dispensing with the organ altogether. The Prophet 08 emulated this effortlessly, and I soon found myself deep into Genesis territory, circa 1980. It also proved more than adequate for recreating the massive Prophet 10 drones of tracks like 'Mama'. Next, I found a new palette of sounds awaiting discovery if I layered a patch using a 24dB/oct filter with another using a 12dB/oct filter. I created sounds with 'hard' transients followed by 'softer' sustained stages, as well as patches (which I obtained by using the envelopes to cross-fade a patch in one mode to a patch in the other) that evolved tonally. But, if you're into grooves, you'll probably find it more fun to use the split and layering capabilities to combine rhythmic patches. There's no end of trance and techno lurking within the 08's spaghetti of sync'able sequencers, arpeggios and sync'd LFOs, and this synth will scream, tear and belch with the best of them. I can't move on without discussing soloing on the Prophet 08. If you want to super-size your sounds, there are three modes of unison; a single dual-oscillator voice for most of your favourite monosynth imitations; all 16 oscillators stacked; and all available oscillators stacked with detune. What's more, you can decide how the keyboard responds in these modes, with low-, high- and last-note priorities, and single- or multi-triggering. If you want to widdle at 100mph, choose one of the four velocity curves and one of the four pressure-sensitivity curves to taste, and the 08 is ideal for the task. There are also four modes of portamento, namely fixed rate and fixed time, applied on every new note or just when you play legato, and the 08 even offers independent slew generators for each oscillator. Solo sounds created using different slew rates can sound wonderful, because the two rates of portamento produce one of the most subtle yet interesting musical effects that is available. Inevitably, the 08 isn't perfect but, apart from the handful of points already made above, you have to look hard for things to criticise about it. I suppose that some people may take issue with the positions of the pitch-bend and mod wheels (which are behind the keyboard rather than alongside it) but I found them to be perfectly useable, and I appreciated the fact that this makes the 08 even more manageable and compact than it would otherwise be. Others might complain about the quantisation of the controls, but this is a consequence of adding memories to any analogue synthesizer, and the 08 is less quantised than many vintage synths. So what of imperfections in the signal path? Sure, there's a tiny amount of bleed in the oscillator mixer and through the filter, and a faint halo of noise that's apparent on some sounds. So what? There was a lot more on some revered vintage synths and, if anything, these minor blemishes only prove again that the 08 is a real analogue synth. Finally, I've heard comments that bemoan the lack of high-pass and/or band-pass filter modes. These would have increased the synth's sonic palette considerably, but I suspect that it would no longer have felt like a Prophet, so I think that DSI made the right decision. You may feel otherwise. At the start of this review I asked whether the 08 is a real Prophet, and whether it can satisfy our nostalgia for all things big, heavy and analogue. In both cases, the answer is 'yes'. The 08 deserves to bear the Prophet name, because it looks, feels and sounds as a Prophet should. Please be clear; I'm too old to be beguiled by an analogue signal path, nor (I hope) am I susceptible to the appeal of the word 'Prophet' silk-screened onto a control panel. When I say that the 08 appears to be the real deal it's because nearly 30 years of experience with Prophets tells me that this is so. That it's so pleasant to use and sounds as warm and involving as its predecessors means that I can see no reason not to buy one if that's the sound you're seeking. There's no immediate competition and, with ageing Prophet 5s and Roland Jupiter 8s now costing around £1500, Oberheim OBXs not far behind, and Yamaha CS80s heading into deep space at £5000 or more, the Prophet 08 is also excellent value. To finish, I'd like to quote something that Smith wrote to me a few days before I submitted this review: "It's been nice to rescue the Prophet name from all the simulations that have multiplied over the years!" To paraphrase Emerson Lake & Palmer, I can only add, 'Welcome Back My Friends, To The Synth That Never Ends'. It's lovely to look at, to program, and to play. It's surprisingly compact and manageable. It's very flexible for an integrated analogue polysynth. It's not only inexpensive for what it is, there's no direct competition. Did I mention the sound? The encoders are perhaps a little too wobbly. There's no keypad, which would speed up some functions. A chorus would have been a bonus. Dave Smith says that he was not interested in recreating a vintage Prophet, only in moving forward. In my view, he has done both, and created the sexiest little analogue synth I've played in years. It's small, it's light, it's powerful, it's flexible, it's playable, and it's gorgeous. Despite a few minor niggles, the fact that it also sounds as good as a vintage Prophet makes it almost irresistible.